Choose from four different Two-Deck Playing Card Sets in Custom Imprinted Boxes: 100% Plastic Playing Cards in Custom Acrylic Boxes, 100% Plastic Playing Cards in Custom Vinyl Cases, Regular Playing Cards in Custom Acrylic Boxes, and Regular Playing Cards in Custom Vinyl Cases. Each Two-Deck Custom Playing Card Set features your logo imprinted on the top of the box or case. 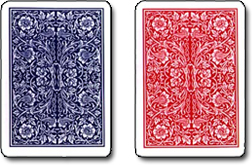 One red and one blue deck is included in each Customized Set of Playing Cards. For more information on our Playing Card Sets in Custom Boxes or Custom Cases, please contact us.